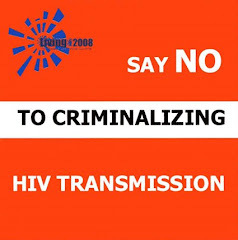 HIV Criminalization – An Epidemic Of Ignorance? Laws and prosecutions that single out people with living with HIV are ineffective, counterproductive and unjust. As delegates from around the world meet this week in Washington DC at AIDS 2012 to discuss how to "end AIDS" through the application of the latest scientific advances, laws and policies based on stigma and ignorance are not only creating major barriers to prevention, testing, care and treatment, but also seriously violating the human rights of people living with HIV. This is especially true in the United States, where 36 states and 2 territories have HIV-specific criminal statutes that single out people living with HIV as potential criminals. However, this growing epidemic of bad laws and prosecutions is a global problem that requires an internationally co-ordinated and concerted effort to overcome. Come meet people living with HIV who have been involved in both sides of a prosecution as well as some of the experts and advocates who are part of a growing global movement, supported by UNAIDS and the UNDP-led Global Commission on HIV and the Law, working to ensure that the application of criminal laws, if any, to people living with HIV is fair, consistent, restrained, proportionate and appropriate, and serves justice without jeopardising public health objectives and fundamental human rights. · Lisa Fager Bediako, Congressional Black Caucus Foundation/ Positive Justice Project, United States. A question and answer session will follow. The press conference will end at 10.45am. To arrange interviews with any of the speakers please contact Edwin J Bernard via email or mobile.